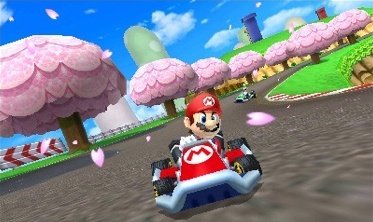 Get the 4-1-1 on Mario's latest racing game. For the most part, Nintendo's kept its upcoming Mario games under wraps, to the point that we know more about Kid Icarus: Uprising than the plumber's latest adventure. This also applies to Mario Kart 3DS. The game is on the way, but Nintendo refuses to elaborate on the new features, roster and courses. That said, we expect to get our hands on it at this year's Electronic Entertainment Expo (June 7-9), where we'll chuck banana peels and pull off insane drifts in glasses free 3D. For now, we scoured the Internet to learn more about this exciting racer. Here's what we found. We hope Princess Peach has homeowner's insurance. 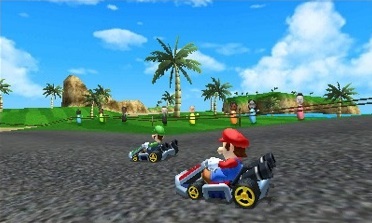 -Mario Kart 3DS will run at a blistering 60 frames per second, making it the fastest portable entry in the series. -Characters will display facial expressions during and after races. They will also glance at opponents as they pass by. The 3D effects will make those cherry blossoms pop off the screen. -Familiar weapons return, including banana peels, green shells and the Blooper attack that splashes black ink on the other players' screens. 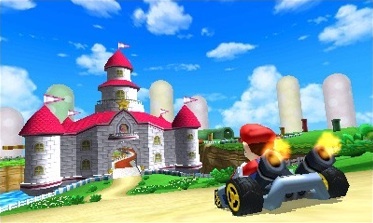 -You can drive right through Princess Peach's castle. Look closely, and you can see Miis in the background. 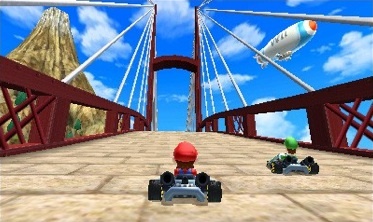 -WuHu Island, from Wii Sports Resort and Pilotwings Resort, is also in the game. -Mii characters appear in the background. Not sure if they're playable. This will look so sweet in 3D. -The game will feature online/local play, as well as the option of uploading/downloading ghost data. 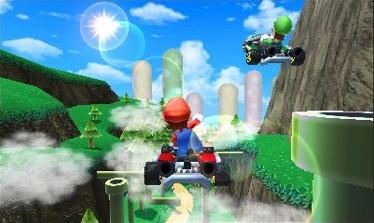 -Mario and Luigi are playable. Seems like Nintendo can't get enough of WuHu Island. -Game supports 3D and Nintendo will use the tech in interesting ways, with blossoms falling from trees. -You'll need to dodge giant goombas and boulders. -Scheduled to release before the end of 2011.